The Master of Engineering (MEng) Program is a course-based graduate program, which is intended to provide continuing and advanced education for recent graduates and civil engineers in professional practice. The program can be taken on a full-time, extended full-time, or part-time basis. A completed undergraduate degree equivalent to a four-year University of Toronto program with a minimum final-year grade point average (GPA) of a mid-B (3.0 out of 4.0 or 75%). Required grades must be achieved in each of the final two years of undergraduate study. Applicants whose primary language is not English and who graduated from a university where the language of instruction and examination was not English must demonstrate proficiency in English. See General Regulations section 4.3 for requirements. Students who do not possess an undergraduate degree in civil engineering may be required to take more than the usual time and number of courses. *For international degrees, please look up the equivalency of your degree. **Required grades must be achieved in each of the final two years of Bachelor study. The MEng program consists of 10 one-semester graduate-level courses (500 & 1000 series courses), 6 of which have to be from the Department of Civil & Mineral Engineering. The remaining 4 can be from outside of the Department, and two of these can be from outside of the Faculty of Applied Science of Engineering or outside of the University of Toronto. MEng students also have the option of doing a 1 or 2 term project, which counts toward your 6 Civil courses. APS courses, offered by the Faculty of Applied Science and Engineering, are counted as part of your 4 courses outside the Department. - Faculty of Applied Science and Engineering. Students enrolled in the MEng program have the flexibility to choose an optional emphasis. Students earning an emphasis would receive a corresponding notation on their academic transcript, acknowledging the depth and focus of the student's studies. See below for detailed information on each emphasis. Fees below are for the 2017-2018 year, which includes the Fall, Winter and Spring/Summer terms. They are subject to change. For full fees information including part-time, extended full time and non-degree studies, please see the Student Accounts site. The MEng professional graduate program is a self-funded program. Learn more about funding your degree. See our frequently asked questions or Contact our recruitment staff. Through the Emphasis in Advanced Water Technologies & Process Design, students are able to gain in-depth knowledge of water treatment methods and design of treatment processes. This specialization is administered by another department in the Faculty, please see this page for course requirements and additional information. Analytics covers a range of methodologies, from descriptive to predictive to prescriptive approaches. Complete at least 6 courses (3.0 FCE) with a combination of core and elective courses as detailed below. One or two of the optional courses may be a 1-term (CIV1001H) or 2-term (CIV1002Y) project (not listed below). Other courses may be considered but will require approval of the emphasis coordinator. Complete six of the following technical courses (3.0 FCE), one or two of which may be a 1-term (CIV1001H) or 2-term (CIV1002Y) project. Other courses may be considered but will require approval of the emphasis coordinator. Every day, people in the developing world struggle to obtain many of the things that most of us in Canada take for granted, like clean water, safe shelter, and basic health care. Engineering students can make a difference. But to tackle these complex challenges effectively often requires a different mindset and a different set of skills. Through the Emphasis in Engineering and Globalization, and other initiatives, the Centre for Global Engineering aims to develop these capabilities in our students. The emphasis offers an innovative curriculum that enables our students to leverage their engineering knowledge and talent for maximal impact on issues of global importance. We develop the wide range of professional skills necessary to address the evolving technological challenges in an increasingly global society. Engineering practice today demands a breadth of skills: not only technical, but also an understanding of leadership, finance and business, management, entrepreneurship and innovation. Engineers often appreciate the importance of such skills only after they join the workforce. The Emphasis in ELITE offers University of Toronto MEng students a broad range of courses in these topics. The first of its kind in Canada, the ELITE Emphasis is targeted at engineers seeking to develop a more well-rounded skill set. Forensic engineers are trained to logically investigate and analyse data from disasters, accidents and failures, and present an unbiased assessment of what the underlying cause may have been using deductive methodologies. The Emphasis in Forensic Engineering creates a unique opportunity for students to gain specialized expertise and recognition for a personal and professional commitment to enhanced engineering investigation skills that will compliment design skills learned in other courses. Forensic engineers investigate accidents and failures commonly causing personal injury and/or monetary loss—the consequences of which are normally dealt with in a court of law. If course descriptions are not visible, click here. An emphasis is not a requirement for the MEng Degree. 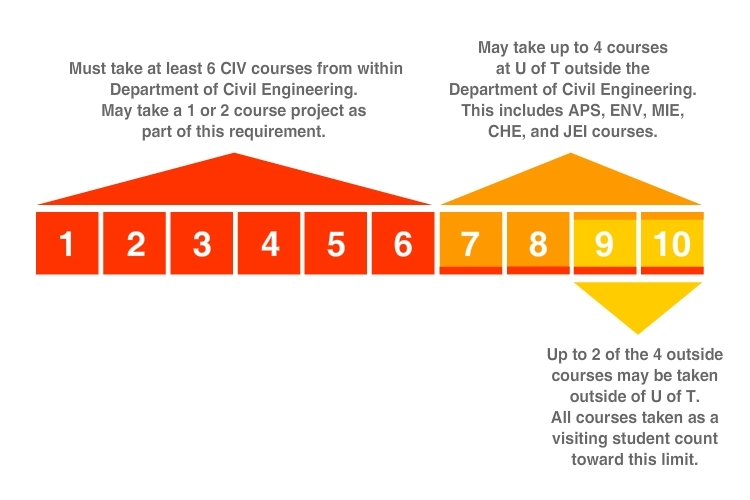 Students must take at least six “CIV” courses (out of a total of ten) to meet the general MEng requirements. Students may double-count at most one course towards any CIV Emphasis or towards any other Faculty Emphasis. One or two of the six courses may be a 1-term (CIV1001H) or 2-term (CIV1002Y) project that is undertaken in the given emphasis area. Courses must be taken as part of the Masters Degree (500-level and 1000-level courses taken as an undergraduate student do not count). Emphases will be applied for by students at the time of program completion.